Would you consider taking brown seaweed for the benefit of your health? Maybe you should. 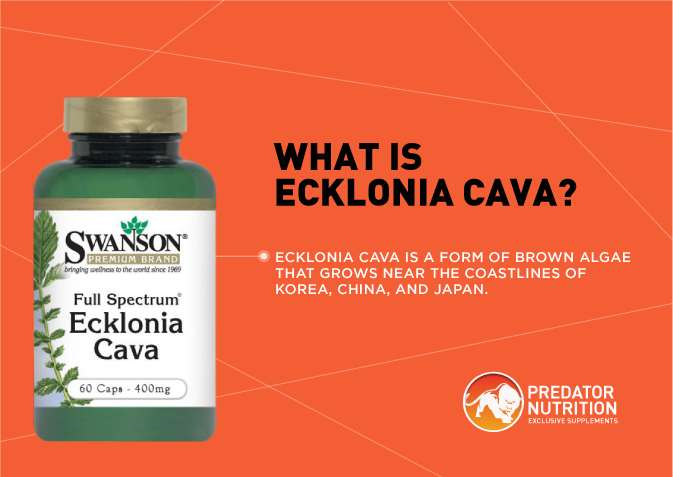 Ecklonia cava, or brown algae, is a wonder food that’s filled with antioxidants and other wellness-boosting compounds. The scientific research is just coming out, but it already shows that ecklonia cava is capable of treating everything from heart disease to hair loss and obesity, and taking it every day will have profound impacts on your health. But what really is this seaweed substance, and can it deliver everything that it promises? Let’s look more closely at the facts to find out. Ecklonia cava is a form of brown algae that grows near the coastlines of Korea, China, and Japan. For this reason, it’s been a beloved additional to traditional Asian cooking for thousands of years. Brown seaweeds like ecklonia cava typically grow in chilly water, and they are a potent source of essential nutrition, both in food and as a supplement. Asian diets have long been famous for their health benefits, and many traditional Asian dishes center around seaweed. Is this a coincidence, or is the seaweed responsible? 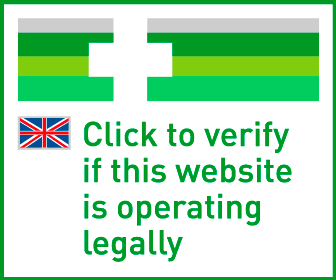 Looking at brown seaweed facts will shed light on the truth. What are some Ecklonia Cava Benefits for Health? While the seaweed was once primarily valued for its taste, today science is discovering that the impressive levels of vitamins, minerals, and other elements it contains add up to an impressive nutrient profile. In fact, the nutrients it contains align closely with what’s naturally in the human body, meaning that they are easily absorbed through the skin and digestive tract. The overall benefits of ecklonia cava are still being discovered, but here are some of the leading ways that taking some daily will improve your health. Compared to other forms of seaweed, ecklonia cava has more phloroglucinols. This is a type of antioxidant that’s found only in sea plants that is a potent form of antioxidants. Evidence shows that phloroglucinols have real-world benefits for blood pressure, blood glucose levels, and overall inflammation. Ecklonia cava also has an impressive number of polyphenols, which is a form of antioxidant found in other healthy foods like green tea, dark-hued berries, and red wine. However, brown seaweed stands out from the rest because it contains a type of polyphenol called Eckols (or phlorotannins) that are as much as one hundred times more powerful than other kinds of polyphenols. This means that ecklonia cava has a higher Oxygen Radical Absorbance Capacity (ORAC) than any other regularly-consumed food available. In other words, the antioxidants available in it are sky-high compared to other foods. As an example, one serving of this brown seaweed contains twice as many antioxidants as the ‘superfood’ blueberries do. And, because the seaweed is fat soluble, the polyphenols it contains can stay in your bloodstream for up to 14 hours. Compared to the thirty minutes that most other plant-based sources can last in your body, the benefits of ecklonia cava are superior. The benefits of this brown seaweed also include acting as an anti-allergen, and applying the active compounds topically is considered to be a proven way to enhance hair growth. Unlike most natural hair growth remedies, ecklonia cava can both inhibit hair loss and improve hair growth, ensuring that it addresses both parts of the problem. The majority of health benefits of ecklonia cava can be linked directly to its antioxidant levels. As antioxidants target free radicals throughout your body, they naturally work to reduce your risk of a wide variety of diseases while improving the overall functioning of your immune system. The research is still in the early stages, but it’s starting to show that ecklonia cava cab work as an effective treatment for type 2 diabetes. This is likely because of diekrol, a phlorotannin contained in the seaweed that lowered the blood sugar levels and oxidative stress in experimental mice. 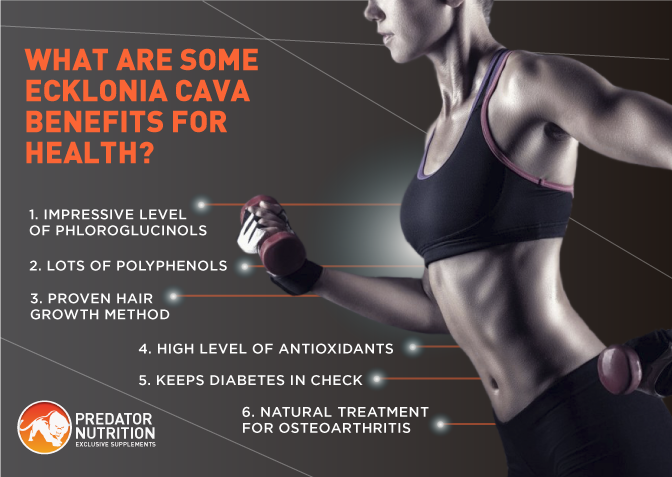 Thinning, brittle bones is an unhappy consequence of old age, but research shows that the phlorotannin compounds contained within ecklonia cava can reduce inflammation and keep osteoarthritis in check, too. People who eat Asian diets tend to have lower cholesterol levels, and brown seaweed might be partly the reason why. Ecklonia cava can help keep cholesterol in check, as experiments have found that taking a high dose of the concentrate can lead to significant decrease in systolic blood pressure. The evidence is still forthcoming, but tests on mice shows that ecklonia cava can reduce inflammation in the airways of mice, which leads researchers to believe that it can have a similar impact on the symptoms of asthma in humans. If you’re looking for an extra boost of energy to finish each workout strong, ecklonia cava might be what you want to try. Experiments have found that it can boost endurance during athletic events, especially when taken thirty minutes before beginning the workout. Fucoidan is a potent compound found in brown seaweed that shows substantial evidence of preventing the metastasis of lung cancer. This might be part of the reason why cancer rates are generally low in Asian populations. The seaweed might also prevent the development of breast cancer, too, as laboratory studies have found that it decreases estrogen levels and moderates the endocrine system. If you’re struggling to maintain a healthy weight, taking ecklonia cava supplements might make the process easier. Studies have found that a regular supplement can increase your resting metabolic rate, as well as decrease fatty deposits in the liver. Radiation exposure can cause dozens of problems for your health, but sodium alginate (a component of brown seaweed supplements) can prevent the absorption of the radioactive substance strontium. This means that adding ecklonia cava to your regular diet might prevent you from absorbing the worst of dangerous compounds from potentially contaminated foods like milk. Today, lab research is tracking down even more health benefits of ecklonia cava. Other benefits that science is uncovering about brown algae supplements shows that it has the ability to cross the blood-brain barrier, improve overall blood flow, stop inflammation before it gets out of control, and protect your body against free radicals. Early research shows that it might help you fight off allergies as well, making this natural plant supplement a smart additive for your health. Should You Take Brown Seaweed Supplements? 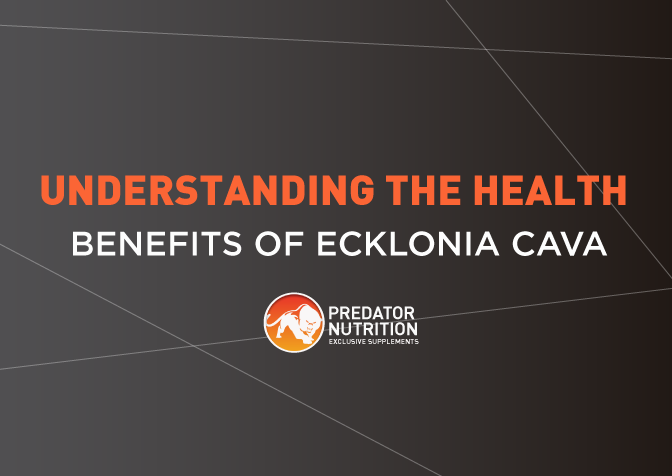 The evidence is clear that taking ecklonia cava supplements can have profoundly beneficial impacts on your health. However, this potent supplement may come at a slight risk for the health of your thyroid. 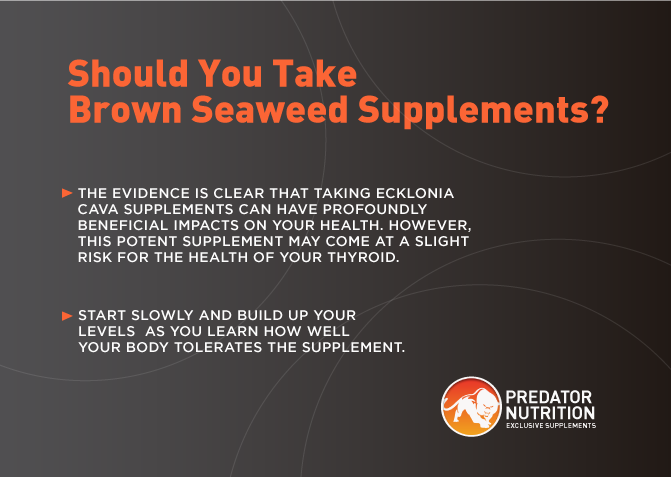 Some initial research shows that supplementing with brown seaweed will increase your risk of thyroid disease, though your elevated risk will go down within two weeks of stopping taking your supplements. However, low doses of ecklonia cava are found to give your body the previously mentioned health benefits without putting your thyroid at risk, so it’s a smart idea to start slowly and build up your levels as you learn how well your body tolerates the supplement. 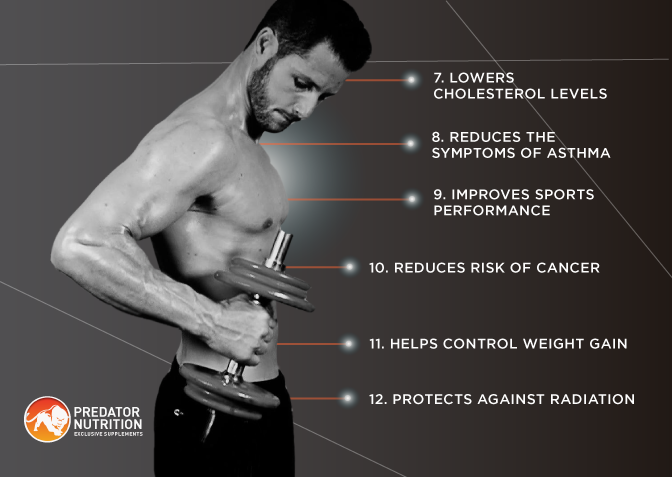 While more research needs to be done to understand the benefits of ecklonia cava supplements fully, the initial evidence is promising enough to start taking these supplements for yourself. More research is expected to be conducted soon, but for now, you can feel confident that taking small amounts of brown seaweed extract will do a lot to improve your overall health and wellness. Take this supplement for a few weeks, and you might be amazed at the difference.